All jokes apart, we saw one such attempt on Tuesday morning, when three men armed with handguns entered the offices of a Canadian Bitcoin exchange in Ottawa, and restrained four of its employees. The intruders then struck one of the employees in the head with a handgun, asking them to make an outbound transaction from the cryptocurrency exchange. A fifth employee in another cabin, who remained unseen in an office, called the police before any assets could be taken, and the robbers left empty-handed. 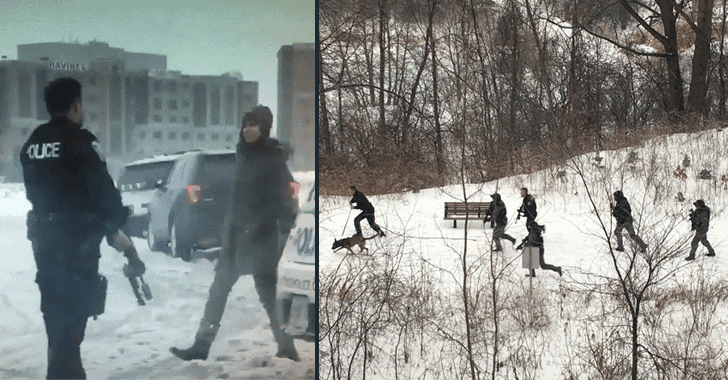 One of the suspects arrested later Wednesday after arriving police officers saw him run into a ravine north of Colonnade Road and deployed "extensive resources," including K-9 unit officers, to find him, CBC News reports. "Police are looking for two additional suspects, both described as black males," the police says. "Investigators are also interested in identifying and speaking to a person of interest that was inside the premise as the suspects arrived. That person did not remain at the scene." St-Hilaire is set to appear in court on January 24, 2018. Ottawa police are now looking for the remaining two suspects. The authorities have not revealed the name of the cryptocurrency exchange. A similar incident happened last month when armed robbers kidnapped a top executive at UK-registered crypto-exchange EXMO Finance and allegedly stole more than $1.8 million of Ether for releasing him. The New York District Attorney's Office charged New Jersey native Louis Meza for the kidnapping and robbery, claiming Meza held "demanded that the victim turns over his cell phone, wallet, and keys while holding the victim at gunpoint."